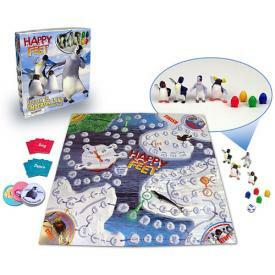 My Family Fun - Happy Feet Return to Emperor Land Board Game The new popular board game with Ramon, Mumble and Gloria! The new popular board game with Ramon, Mumble and Gloria! 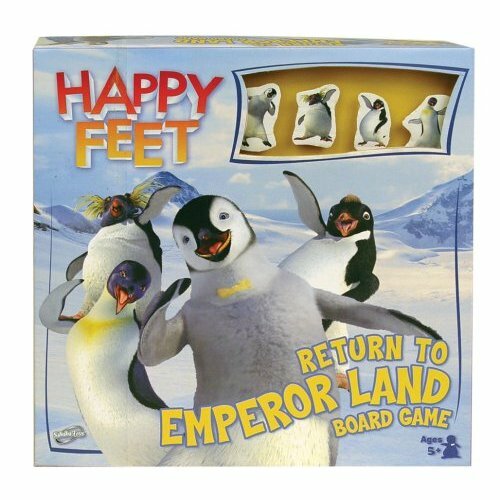 The new board game Return to Emperor Land, staring out as eggs, Mumble, Gloria, Lovelace and Ramon hatch in to penguins and begin their journey. Help them travel to Adelie Land, Blizzard Country and the Zoo by taking risky shortcuts or choosing safer routes. The first penguin to return saves Emperor Land and wins the game! This game includes game board (20 x 20 inches), die, 4 egg play pieces, 4 penguin play pieces (Mumble, Gloria, Lovelace, Ramon), detachable spinner, 20 accidental cool cards, 15 fish cards, 10 sing cards and Instructions. 2-4 players, ages 5 and up.